Creative play has a central role in children’s learning and development. It fosters creativity, nurtures the imagination and stimulates important problem-solving, thinking and motor skills. While children may not yet have the language skills to communicate their feelings, they can often express themselves through music, song, dance, drama and visual arts. Art also helps children develop their senses through exploration and discovery, so they understand more about the world they live in. Young children should be exposed to the creative arts as their cognitive skills mature, it is thought that their right brain will be as developed as the left, and both hemispheres work in tandem, thus achieving the full potential of the mind. And let’s not forget – children love creative arts! In our Inspired program, we encourage children to participate in creative art experiences every day. 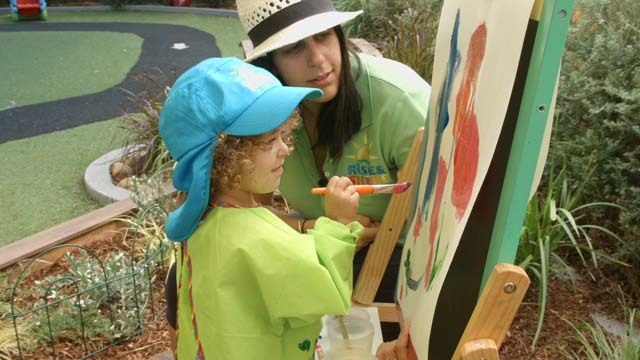 Your child will enjoy activities including painting, drawing, music, puppetry, dance, drama and more. We also welcome a number of special guests throughout the year, who entertain the children with fun and interactive theatrical performances. If you recall your most treasured memories of childhood, there’s a good chance that it involved being in the great outdoors—camping, fishing, swimming at the beach, searching for bugs or climbing a tree. These days, children are spending so much time indoors that they are missing out on the benefits of playing outdoors. develop respect, appreciation and a responsibility for nature. We’ve developed outdoor classrooms at our RSK centres that complement our indoor learning spaces and provide children with hands-on experiences in nature. When children play or learn in our outdoor classrooms, they will see real bugs, eat fresh herbs and experience nature the way it was meant to be enjoyed. We aim to educate, motivate and inspire the children in our centres to become environmental advocates. By participating in sustainable practices and understanding how to respect the environment, we teach your children lifelong values about caring for our world. Our outdoor classrooms stimulate children’s senses, creativity and appreciation for the natural environment. They feature sensory and edible gardens, outdoor seating for classes, vegetable patches, creative art spaces, music and movement spaces and even al fresco dining areas. The children learn to grow vegetables and herbs as part of our green thumb gardening program, before heading into the kitchen to cook them up as part of our Mini Bakers program. To learn more about our Inspired program, contact our educators or book a tour to experience the Shine Advantage.